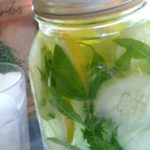 Posted May 5, 2015 by Heather Michet & filed under Drinking Water, Exercise, Fitness, Food As Medicine, Health Tips, Medicinal Plants, Recipes, Water. Do you or someone in your family not “like” water and therefore don’t drink it? Are you achy and sore because of your boosted exercise schedule (good on ya!!)? Or do you simply want something a little sexier than plain water now that you’re drinking loads of it each day? Say Yes! Yes! Yes! to Toning Water. It is refreshing, tasty, uber easy and inexpensive (in dollars and minutes ) to make. This yummy brew helps move lactic acid and stored toxins out of the body, both of which can cause achy, stiff joints and lead to mobility issues. Make this liquid delight often and feel your body smile. 1 lemon, scrubbed and thinly sliced, preferably organic. You can also use orange and/or lime. Add the above to 64 ozs. filtered water and drink frequently. Store in refrigerator. Replenish with fresh water as needed; remove ingredients when they no longer offer flavor. Begin with fresh goodies and repeat! This combo helps detoxify the body, especially the joints and muscles. Plus, because the flavor is so heavenly, it helps you stay hydrated.